If you're looking for a fantastic high-end compact then the RX100 V ticks plenty of the necessary boxes. It's just that now, in 2017, it's not a full score card any more. Not at this price point anyway. 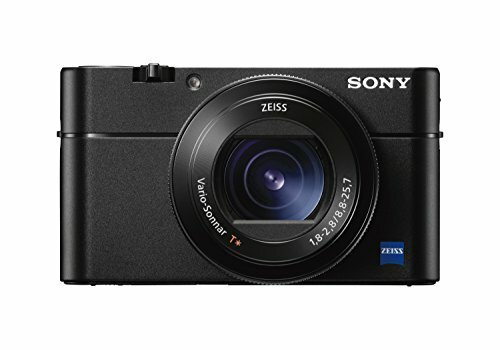 Sony has completely owned the high-end compact camera market since the launch of the original RX100 back in 2012. From the third-gen model, it tore up what a palm-sized compact could do by introducing a built-in electronic viewfinder and faster lens. The fourth-gen model raised the resolution stakes. As we roll into 2017 the fifth-gen model, the RX100 V, is here along with a more advanced autofocus system (similar to that from the top-end A99 II). But with its £1,000 price tag, and with the competition clawing at Sony to get a foot in the door of this now bustling 1-inch sensor market, does the RX100 excessively rest on its laurels rather than bringing enough new features to warrant its hefty price tag? Sony RX100 V review: What's new? Given that the RX100 V is around £250 more than the RX100 IV currently costs in shops, you might think there are huge differences between the two. That's not really the case, though. There's still no touchscreen control, which is a bizarre and lazy omission from a camera such as this, while the design, lens and viewfinder all remain the same as before. However, there is that new hybrid autofocus system with 315 autofocus points used for phase detection and more precise tracking. This introduces the AF-A autofocus mode, which is like a hybrid between single and continuous autofocus, able to activate when it needs to. Although the RX100 V has got the same 1-inch Exmor RS 20.1-megapixel sensor as the IV model - the "RS" designating that it's multi-layered for the best possible light-gathering properties - the Bionz X processor adds a larger buffer so it's altogether faster. That means 24fps burst shooting (up from 16fps) and 4K video at 30fps (up from 25fps). In summary the differences are apparently minor overall. So how does the RX100 V fare in the real world? Sony RX100 V review: Is it worth the money? So you're thinking about spending a grand on a camera. That's no small matter. Especially for a 41mm thin, palm-sized compact that's pricier than some mid-level system cameras. So is the RX100 V worth it? The answer is a mix. In many senses you'd be better off saving the cash and buying the third-gen model (because you could almost buy two of those for the same cash as the V). And let's not forget the Panasonic Lumix LX15 offers better performance, while the Panasonic Lumix LX100 offers a larger-still Micro Four Thirds sensor. But the Sony has its merits, particularly for continuous autofocus - which we'll come to later. In terms of build there's no doubting the RX100 V is a quality product. Its metal build feels sturdy, that rear LCD screen is easy to manipulate, but we do wish Sony would invest in touchscreen controls and a Gorilla Glass coating for some additional ruggedness. Then there's that built-in pop-up electronic viewfinder which, when first launched in the third-gen model, was a stroke of genius. But it's always had its shortcomings: you need to pull the rear element out for it to lock into place; it doesn't lock into place firmly enough, so can slide out of focus; when pushing it back into the body it automatically switches the camera off entirely; and the 0.39-inch size isn't exactly huge compared to the potential an accessory viewfinder might otherwise offer. Sony has had time to fix these issues, but they're all still present in the RX100 V - which feels kind of lazy. Sony RX100 V review: How good is the lens? The lens remains the same as it's been since the RX100 III, but it's a good'un: the 24-70mm f/1.8-2.8 equivalent ensures fast shooting whatever the conditions. That means a fast aperture starting at f/1.8 at the widest-angle setting, which dips down to f/2.8 by the longest focal length. As much as we'd like it to be longer and the tele end, that would mean an increased body size. And a big sell of the RX100 has always been it's palm-sized and pocketable nature. And we've always had nothing but good things to say about that lens when tested, which translates once again it the V model. It's sharp, it's quick to operate and, despite not delivering the ultra-zoom that some compact competitors might, it's perfectly fitting for the scale of a camera such as this. That it collapses back into the body is a great job. There's also a lens control ring to the front, which freely rotates in an infinite rotation. It's buttery smooth. As we said of the previous camera there's no option to give the ring dual purpose control - a feature that you'll find in some Olympus models, where a switch shifts smooth rotation into click-stops - for aperture control. And without a dedicated aperture ring - something all the more absent given just how good the Panasonic LX15's one is - the RX100 V, again, feels like its being a little lazy rather than trying to push things forward. These are all opportunities that could have been acted upon between generations. Controlling the camera is easy enough, as the rotational rear d-pad is handy, but all the buttons are on a small scale. There's only so much you can do with limited space, though, but we feel things could be arranged a little better. The movie button, for example, juts out at an angle and the number of times we hit that and auto-activated movie capture was infuriating. Sony RX100 V review: Better performance? At its inception the first-gen RX100 acted just as we would expect of a compact camera. But that was five years ago. Since then we've seen the RX100 series improve step by step - with the RX100 V certainly being the best of the bunch. Its new hybrid autofocus system is certainly snappy, but it's not the best one we've ever used. We also have the Panasonic Lumix LX15 on test in tandem alongside - which is typically better and adds the ease of touchscreen control. That's a bit of a hiccup for this £1,000 Sony camera. Furthermore, for single autofocus, the RX100's repeat use of small/medium/large one-point focus area options is, again, lazy - and less precise than the pinpoint option found in the Panasonic - when there's been the opportunity to expand these options. It's in continuous autofocus where Sony has really pushed things forward. The Expand Flexible Spot and Lock-on AF Expand Flexible Spot options make use of that 315-point phase detection setup, with small in-focus boxes showing where focus is acquired. It's very good. The former of those modes will adapt as you move the camera to trace the focus point, the latter will lock onto the subject and attempt to track that within the frame - even if it falls outside of the focus point. This is much more advanced and just the kind of thing we've been waiting for in a handheld compact. It's much like what you'll find in the flagship A99 II camera. Also notable is the 24fps shooting for up to 150 shots at a time. The RX100 V does this without slowing down. Where some cameras offer this kind of speed, they noticeably slow the capture rate as the buffer fills. The Sony also offers this with continuous focusing, so you can accurately track a subject and there's minimal blackout between shots. This should appeal to anyone capturing fast-moving objects and looking for that perfect shot. Just make sure you fix the other settings up so there'll be no blur. We had the chance to test this fairly heavily with dancers and some fancy dancing paint (on a boombox). The high-speed continuous shooting is just a couple of clicks away, then it will rattle off shots like a minigun. That's all fun, but there's one noticeable downside: once you've captured all those photos they then need to be saved to the SD card and this takes some time - even with a fast card. At least you'll get an indicator showing how that writing is progressing. But be warned, just because you can shoot 24fps doesn't mean you'll always want to. When it comes to image quality, the RX100 range has always done itself justice. In the RX100 V you're effectively getting the same thing as you did from its IV predecessor thanks to the same sensor. But that's not disappointing at all, because the quality is excellent. It's near impossible to complain about the quality of images we've been getting from the RX100 V. From low-light ISO 6400 snaps in late night tiki bars, to ISO 1600 shots in breakfast bakeries, the sensible ISO 125-12,800 (standard) sensitivity ensures the camera is kitted out with what you'll need to get great images… although we'd be reluctant to push above ISO 6400 (the camera won't in its Auto ISO setting, that's for sure). When the light dips is when the RX100 V really shows its worth. A lot of which is thanks to the lens: its fast aperture keeps higher ISO sensitivities at bay, while beautiful bokeh backgrounds are easily achieved thanks to the larger-than-average 1-inch sensor size coupled with the wide-open aperture. We didn't often use f/1.8, but f/2.8 at the 70mm equivalent looks fantastic. Even when high sensitivities do need to be used, the results are still impressive all things considered. Shots at ISO 1600 show little disruptive image or colour noise and there's still plenty of detail to play with, whether working from JPEG or raw files. It's this kind of performance that puts the Sony leaps ahead of a standard compact. However, the competition is closing in - you only need to look to the Panasonic LX100 for that, for example. There's no doubting that the Sony RX100 V is a brilliant compact camera. It's small, it's powerful, its continuous autofocus is notably improved, the images it can enable you to capture are great… but it's not that different to its RX100 IV predecessor, which makes its £1,000 price tag hard to swallow. While we love the RX100's pop-up viewfinder, it still needs tweaking. The rear vari-angle LCD screen is useful, too, but without touchscreen it's a step behind the advancing competition. There's no aperture ring either. It all feels a little like Sony is excessively resting on its laurels. Plus the competition has started to attack the 1-inch sensor market harder than ever before. The likes of Canon, Fujifilm and Panasonic each have their own prospects, all of which are more affordable and, in some cases, arguably better than the Sony.